Why are good harvests bad? Harvests in different parts of the South have been a mixed blessing this year. In late November, the Argentinian peso suffered its biggest decline against the dollar in six months as the end of the harvest season reduced the flow of dollars into the country. In September, the country's trade surplus (the excess of exports over imports) fell to a 20-month low, a trend now exacerbated by falling agricultural exports. "There's little for exporters to sell because the crops are all in," said Eduardo Maritato, a Buenos Aires trader. 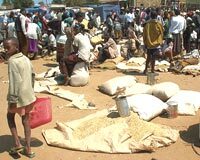 Elsewhere in Ethiopia, a predicted good harvest raised the bogey of falling prices, forcing government to announce it would buy grain from peasants to secure a fixed base price. Government officials fear that hard hit farmers will be further affected if crop prices drop due to excess supply in traditional breadbasket areas of the country. "It is obvious that the problems of agriculture need not always be associated with drought," said the ministry of information. "Even in times of good harvest, there can be market problems."